Zum Tagesbeginn den Sloganizer mit Material beschickt, das dem heutemorgigen Stand der Dinge da draußen entspricht und sich eher für ein Haiku eignen würde (Morgen / blau / scheinen). Morgen - denn blaue Liebe scheint selten. 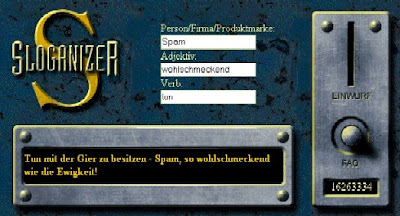 Spam, so wohlschmeckend wie die Ewigkeit! Ein Schwesterprodukt von Poetron (siehe letzter Artikel) ist der Sloganizer, der auf die Werbebranche spezialisiert ist. Sie führen knackig und wütend. Sie schreien dezent und zart. Schlange, knackig bist auch du! Doch was schreien, was träumen? Zu genial und Schlange ist schuld! Es träumt der knackige Kumpel. I moan my gooses and all is dig again. And stay me light, needed me quite shady. But I need old and I duck your name. At least when flat moans they dig back again. This is a generated madlib poem (go get one for yourself here). It doesn't sound bad – well, Izzy tuned it about 7 times until she was halfway satisfied with it – and has only a few rough grammatical edges. Please permit me to introduce myself to you. I am PETER FISCHER, An Accountant in London, United Kingdom. I got your contact from the British Council, and I have decided to contact you so that we can carry out this mutually beneficial business transaction. My late Client (A National of your COUNTRY) until his death aboard an AERO FLIGHT 801 in 2001 deposited a total of USD$5.5M with THAMES BANK, UNITED KINGDOM. He gave me the custody of the deposit documents, and as such entrusted me with the Legal Rights to transfer and execute this deposit to any Next of Kin after his demise. I have since tried to locate any Next of Kin without success, hence I decided to contact you so that you can rightfully stand as the next of kin to inherit the deposited sum by virtue of the fact you share the same SURNAME as my late CLIENT. I am writing you confidentialy because you will be able to claim this DEPOSIT because you have the same SURNAME as my Late CLIENT. You will be entitled to 30% of the total sum should you be willing to assist me in this business transaction, 10% will be earmarked for taxation expense and I will get the remaining 60%. I will prepare a formal agreement to guide us in this transaction for accountability purpose. Good to know I'm known to the British Council. Nigerian scam has come a long way. At least the grammar and spelling in this one are OK. Congrats, Peter, you seem to have gone to school. Thanks for your special, individual confidence in me, Peter, which I probably only share with the millions of other SURNAMES you sent this mail to. Sorry to hear about your LATE client. I'm sure he had the confidence in you that you doubtlessly deserve. At this point, I cannot make use of your offer, Peter. But maybe lots of other potential and fully confidential business partners will send you e-mail and give you calls as I've decided to make this public. Entstanden in Folge von Grübeln über Einsamkeit, ihren Schmerz und ihre Allgegenwart selbst in Gegenwart anderer. Außerdem Nutzung bzw. Missbrauch der dreiteiligen Form der Ode (Strophe, Antistrophe und Epode) ohne, so hoffe ich, Abgleiten ins oft allzu Öde der Ode. Sollte man mir Plattheit oder Abgeschmacktheit vorwerfen wollen, verweise ich auf Pablo Neruda, der Oden auf so alltägliche Dinge wie Sellerie oder Zwiebeln schrieb. Warum also nicht auch auf elektrisch-chemische Prozesse. Aus dem Englischen übersetzt vom Autor. 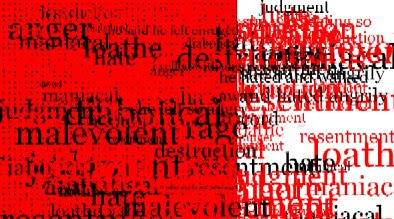 "linguasso (for lingual and Picasso) creates totally random works of art, composed of text and based on varying emotions. It chooses an emotion, then displays associated words and dynamically created sentences in random fonts, sizes and places. It's quite addictive to watch over and over again, as each design seems to tell its own story."